• Learning Korean is easier when you know Chinese characters! • Learn frequently used Chinese characters in Korean! • Enhance your vocabulary by using words written in Chinese characters! • This book will make it easy to read and write Chinese characters! This book is intended for foreign students learning Korean. It was developed by the Korean Language Education Center in the Language Research Institute of Seoul National University reflecting the needs of the learners of Chinese characters. For teachers, the book shows how to teach the Chinese characters that learners often find difficult. It is composed of the most frequently used Chinese characters. The beginner level is focused on learning characters and the intermediate level on word formation. The systematic structure of the book will help learners grasp Chinese characters easily. 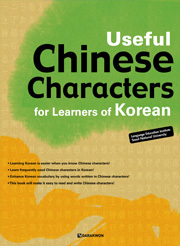 • The Chinese characters in the textbook were chosen to expand the Korean vocabulary. • You can expand the Korean vocabulary by learning frequently used Chinese characters in Korean and the characters often used to make compound words. • This book has a systematic structure: the beginner level is to learn single characters and the intermediate level is to learn words written in Chinese characters. • You can practice the characters learned in < Today’s Characters > in context, and also see how a character is really used in a word. • Through the various exercises in < Let’s Practice > , you can practice and write the Chinese characters that acquired in each chapter. If you want to buy our Korean Language Books, or have any questions, please send an email to : webmaster@darakwon.co.kr We will reply to you as soon as possible. Our 'Korean Books' Website URL has changed!